Turf Fuel’s XChange is a high carbon blend of university proven biostimulants to bring the best out of your soil, turf and landscape plants. XChange’s humic acid gives your landscape access to otherwise unavailable soil nutrients while shielding plants from sodium damage. The high carbon load in XChange brings your soil to life by delivering key food supplies to microorganisms. XChange also contains sea kelp and salicylic acid, that’s right, Aspirin. Salicylic acid prepares plants for stress and disease attack while our unique sea kelp jump starts new rooting. 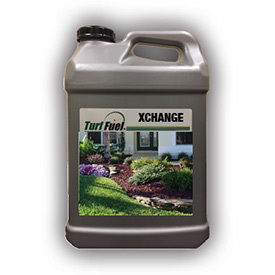 Use XChange from Turf Fuel to get the most out of your plants and soil!